Welcome to ROSETHORN TERRIERS. Home of AKC and UKC Registered American Rat Terriers. We breed both miniature and standard size Rat Terriers. Pictured above are brother and sister Champion Rosethorn Almighty Shogun (left) and Champion Rosethorn Saint Vitus Dance aka Sidney(right). We are proud and happy that a son of CH Rosethorn Almighty Shogun won Best of Breed at the 2016 Westminster Dog Show the first year that Rat Terriers were able to compete. Rosethorn Terriers is located approximately two hours east of the San Francisco Bay Area in Coulterville, CA. We moved here 13 years ago so the dogs would have a wonderful spacious property. ROSETHORN is 7 acres of dog heaven nestled in the gold country foothills near Yosemite National Park. Almost 30 year's now of devotion to our terriers. We LOVE Rat Terriers. The American Rat Terrier is a true companion dog. Our's are sturdy and built to last. True athletes our Rosethorn Terriers have superb people skills as well as excellent hunting ability. Rat Terriers, beautiful to look at and a joy to live with! A lovely family dog, they get along well with children of all ages and have a kind nature with other pets. Rosethorn Terriers breeding program is all about great temperament and supreme health for the dogs and their offspring. ROSETHORN TERRIERS goal is to offer a healthy lifelong permanent family member to our owners. Rosethorn breeding dogs each individually embody the excellent qualities we adore about the Rat Terrier breed. We carefully breed top quality individuals. At Rosethorn we stay true to the standard of the breed and retain the unique qualities that made us fall in love with raising American Rat Terriers. ROSETHORN TERRIERS breeding dogs define correct conformation, athletic ability, intelligence, dedication and loyalty to their owners. Our dogs have a proven history of joyous health. All ROSETHORN Terriers and pups are home raised. Each one is loved and played with everyday. ROSETHORN TERRIERS puppies are up to date on shots, worming and come with a two year genetic health guarantee. We are very careful with placement of our puppies, and stand behind each Rosethorn Rat Terrier that we bring into this world 100 percent. Let our Champions be your companion. Come on up and take a look. You'll be glad you did! **ALL ROSETHORN TERRIER BREEDING DOGS ARE PLL CLEAR. ** We are committed to eradicating Primary Luxating Lens disease from the Rat Terrier breed. I am always happy to answer questions about ROSETHORN TERRIERS and the American Rat Terrier Breed. I look forward to meeting you and helping you find your perfect Rat Terrier family member. I have an open house policy and invite you to come on up and meet the dogs and learn about this fabulous unique breed. At Rosethorn Terriers we are committed to retaining the true qualities of our beloved American Rat Terrier. We do not interbreed Decker Terriers, Basenji, or any other off-shoots of the true American Rat Terrier. Thank you for considering Rosethorn Terriers in your search for a new permanent doggie family member. I look forward to meeting you. 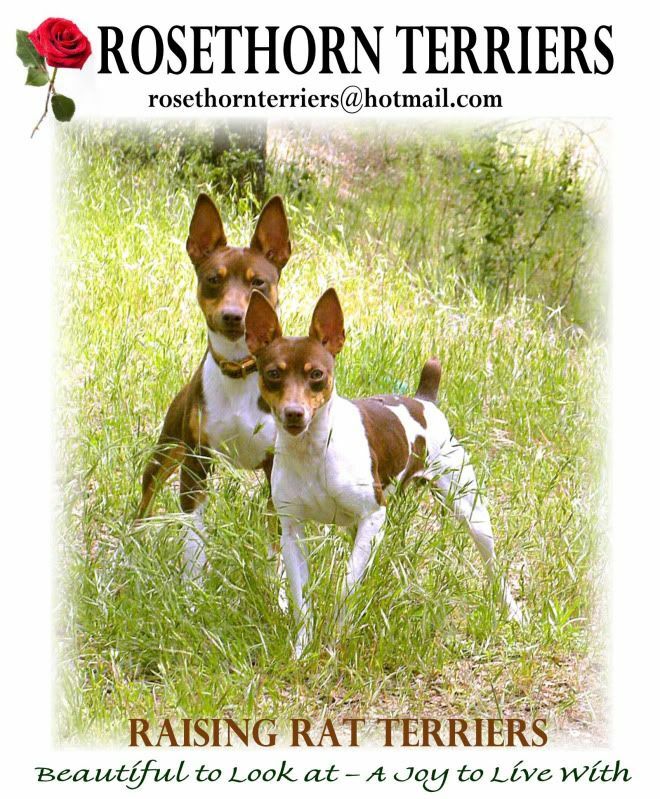 We are always happy when people come up to learn about the breed and meet our beautiful, well mannered, and devoted Rosethorn Rat Terriers. You are invited to come on up and have a happy puppylove filled day. Enjoy!! We prefer a phone call so we can get to know you personally. Calls returned within 24 hours. Have a happy love filled day!! 1 - 5 of 5 Total. We are reducing our dog numbers. If you have a permanent loving home to offer one of our Rosethorn Terriers please call me at 209-743-1664. I am making the following adult dogs available to permanent and appropriate homes only. All are double registered, PLL clear, healthy and up to date on shots and worming. All these dogs are a loved family members. I will be choosing the best possible permanent home for these lovely individuals. Evacuation of all the Rosethorn Terriers for 7 days during the DETWILLER fire is the reason I am reducing my dog numbers. That is the only reason I am making these beautiful, loving Rosethorn Rat Terriers available. Serious inquiries only please. Call 209-743-1664 to discuss adding one to your forever family. Presenting the final 5 exceptional stud dogs here at Rosethorn Terriers. Rosethorn Terriers has taken a strong stand against the breeding of Rat Terriers who are carriers, affected or unknown status of the genetic disease PLL. In support of this I am posting the PLL testing of my foundation dogs and on outbred studs that contributed to the current line of Rosethorn Terriers breeding dogs. The current dogs that contribute to Rosethorn Terriers are PLL clear by parentage. In 10 generations I will once again pay to have my breeding dogs tested in order to validate the genetic Clear By Parentage status. All this information is available to anyone on the OFFA.org website under PLL testing. Thank you for your time and commitment to a future Rat Terrier Breed that is completely clear of this heart breaking disease. This folder contains dog show photo's and achievements of our breeding and retired Rosethorn Terriers, as well as our extended Rosethorn Terriers family who show their dogs. Enjoy!